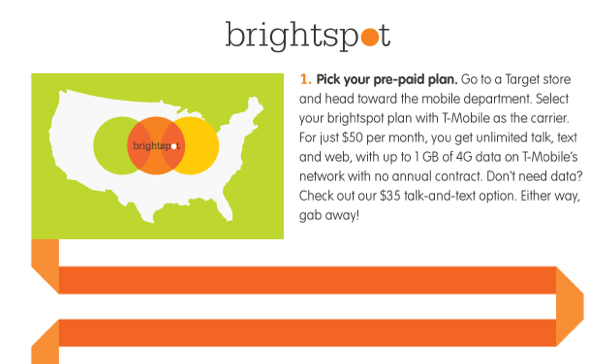 Target took to its company blog this evening and confirmed the announcement of “brightspot,” it’s new prepaid offering with T-Mobile launching October 6th. Target highlights two rate plans, a $35 offering talk and text option and a $50 per month plan that offers unlimited talk, text and 1GB of 4G web. Perhaps the most enticing aspect of being a “brightspot” customer: every six months of paid service is rewarded with a $25 Target GiftCard. On top of that current Target REDcard holders will receive a five-percent discount on the two rate plans. 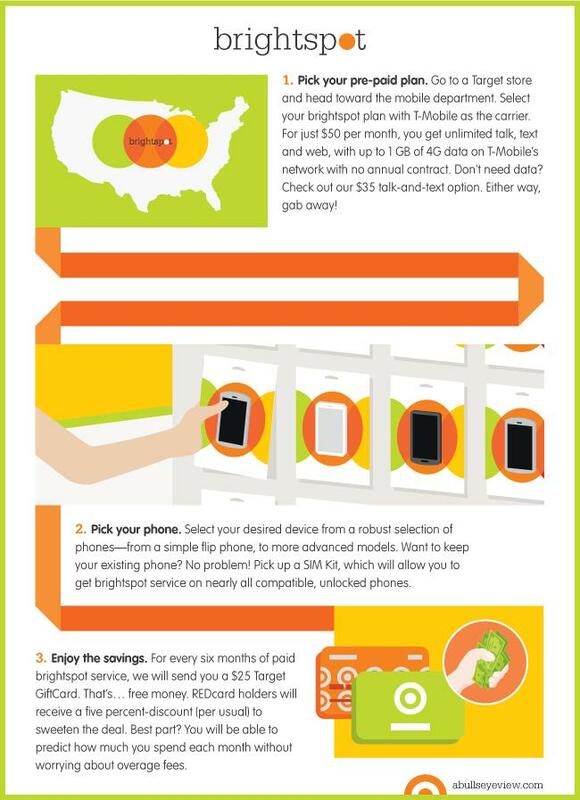 All in all, brightspot seems like a direct attempt at competing with Walmart’s Straight Talk and other prepaid MVNO services. Given that the service itself will launch out of the gate with LTE availability on T-Mobile’s network, it’s already got a leg up over the competition. If all of this sounds good, you can make your way with your unlocked GSM device to Target or pick up one of the select brightspot models on October 6th. Very tiny voice roaming area . I doubt that this is a stand alone MVNO, as they name T-Mobile in the promo material. If you check Simple Mobile’s website, they only say “With SIMPLE Mobile, you’re part of one of the country’s largest 4G networks” without actually naming that network. Even Straight Talk doesn’t name the network for coverage purposes. They only name the networks when specifying which SIM card a customer should get. Read what it says. “Unlimited data, with 1GB of 4G”. You’ll be throttled. You can do the $35 plan and just use data on WiFi networks, right? You can use wifi on a phone with no service. Its like turning into just an MP3 Player or iPod with apps. guests? What kind of new age doublespeak mumbo jumbo is this? When you work at tmobile, its what we call customers. not allowed to refer to them as anything else. option to lessen the amount of each monthly payment for the phone? Putting more down will lower the monthly payment. Also, spam link removed from your original posting. without signing up for the service?